Gugudan's Mina and Weki Meki's Choi Yoo Jung went out on a friendship date on 'Battle Trip'! 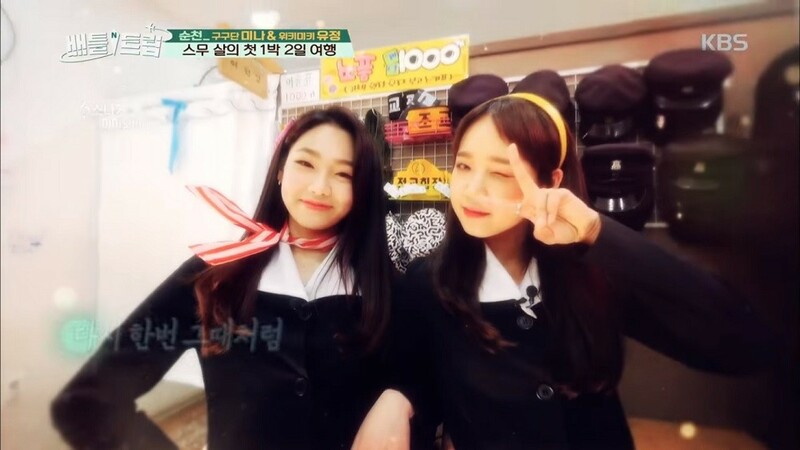 On the April 28th installment of 'Battle Trip', Mina and Choi Yoo Jung went on a trip as 20-year-old buddies who have shared a meaningful friendship since the days of IOI. Their trip will go against Wanna One's Park Ji Hoon and Park Woo Jin's, whose segment will air next week on May 5 as part of the 'Produce 101' special. For the trip, Mina and Choi Yoo Jung chose the Jeolla Province, where they could visit the cities Sunchon and Gwangyang by way of train rides. The theme of their trip was 'the Spring Flower Trip of 20-Year-Old's', so their main goal of the day was to find lots of blooming flowers! When they finally arrived in Suncheon, Choi Yoo Jung insisted that they purposely wear vintage school uniforms to take fun and memorable photos. Afterwards, the two went to get some spicy rice cakes, as well as other street-type foods that Mina used to enjoy eating while promoting as IOI. But because the rice cakes were just a tad bit too spicy, Choi Yoo Jung ended up sweating throughout the meal! With the goal of seeing flowers still on their mind, Mina and Choi Yoo Jung eventually headed toward the National Garden in Sooncheon. It was home to over 100,000 flowers, and the beauty of the tulips made a special impression on the girls. In Gwangyang, the girls ate other types of province-specific foods, and later visited a popular dessert place to try their special macarons. Just like ordinary SNS-lovers, Mina and Choi Yoo Jung displayed excitement as they took photos of the pretty dessert displays! They also had wine in the evening for the first time together as 20-year-olds, ending the day with both delight and shy awkwardness. But their night actually did not end there. As a surprise event, Mina and Choi Yoo Jung went to go see the famous Rainbow Fountain nearby, when all of a sudden the words of 'You-and-Mi (me) Happy 20th' popped in front of their view. Choi Yoo Jung looked at Mina with a bewildered expression, and Mina simply responded by hugging her friend and thanking her for such a wonderful day. Eventually, the two even shed a tear! What a full day of lovely friendship in springtime. Would you like to go on a similar friendship tour like Mina and Choi Yoo Jung's? Stay tuned for Park Ji Hoon and Park Woo Jin's trip next week!